i-Clamp Insulation Displacement wire connectors provide a quick and secure method of connecting wires and devices. The i-Clamps easily pierce the wire insulation to make a tamper proof and reliable connection without the need to cut, strip or otherwise secure the wires. i-Clamps minimize the time and labor of connecting wires. Using i-Clamps replace the use of wire nuts and electrical tape while providing a secure wire splice/connection that is not dependent on the skill level of the installer. Without having to strip or prepare the wires, installation time is dramatically reduced while connection security is enhanced. and vibration environments as well as provide the ability to visually inspect the connections. wire exposure or nuts and tape falling off over time. Use T-Series connectors when you want to branch off of a common wire run. 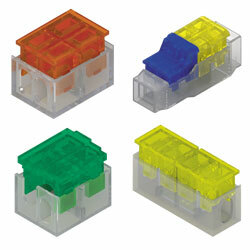 Ideal for wiring several fixtures in parallel such as lighting. The connector hinges open to allow the wire run to be ran thru the connector without cutting or stripping the insulation. Use Two Way Series connectors have a unique dual channel which allows pre-assembly onto a component or fixture. Once installed, the wiring can be completed by simply attaching the wire to the existing wiring. Use One way series for connecting several lines together. Eliminates twisting wires together and adding correct wire nut and electrical tape. Connection can be inspected because connector is made from translucent polycarbonate.